Standardized fault inputs to aid the development of faulty models. Automatic fault package generation to help the user to select the faults. User's Guide: Library description and user guide. Examples: Examples of how to use the library. 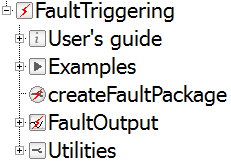 createFaultPackage: Most important function of the library setting the faults and generating. FaultOuput: Models sources of faults. The research leading to these results has received funding from the European Union’s Seventh Framework Program (FP7-284916) for ACTUATION 2015 under grant agreement no. 284915. 2013-11-12: Library is renamed to FaultTriggering. All internal names are updated from Failure to Fault. Icon update to match Modelica 3.2.1 standard.